How to draw portrait of Luke Skywalker from Star Wars. Learn to draw the legendary Luke Skywalker step by step with instruction from professional concept artist. In this tutorial, you will learn to draw the last Jedi Luke Skywalker. This step by step tutorial is suitable for both beginners and intermediate. It would help if you already understand how to draw and shade a bit. If you already have some basic drawing skill, you can learn quite a bit from this short lesson. I made this to be basic drawing but still base on realism sketch base. The drawing of Luke Skywalker doesn’t resemble any actor in particular, it is just my take on what he might look like in realism apporached illustrated sketch style. You will learn to draw a guy portrait from a rough scribble to finished black and white sketch of Luke Skywalker from Star Wars. Luke Skywalker was a legendary war hero and Jedi who helped defeat the Galactic Empire in the Galactic Civil War and helped found the New Republic, as well as the New Jedi Order. He found out that his father is Darth Vader, Dark Lord of the Sith. Then Skywalker’s life changed forever. A chance purchase of two droids, R2-D2 and C-3PO, led to him to receive training in the ways of the Force from Jedi Master Obi-Wan Kenobi and to meet Han Solo, and Princess Leia Organa, who was, unbeknownst to him, his twin sister. Skywalker then destroyed the first Death Star and joined the Rebel Alliance. 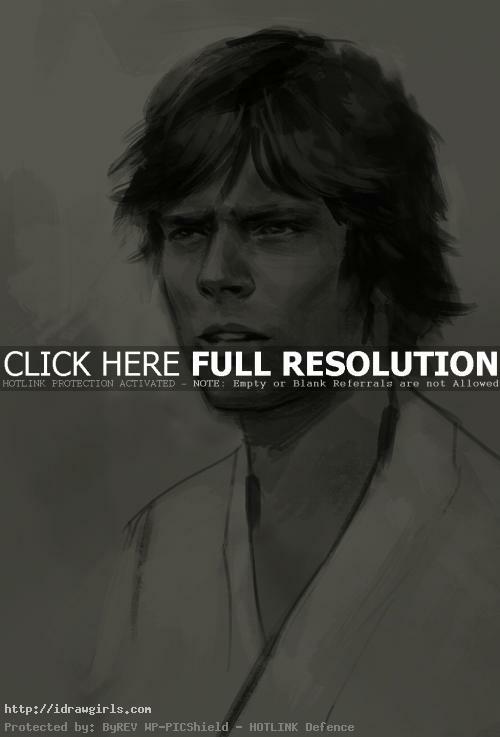 Below are step by step process how to draw Luke Skywalker. Step one, I sketched out simple basic facial structure. Step two, I drew his eyes, nose, and lips on top of the measurement lines. Then I drew his hair loosely on top of the skull. Step three, I add some tiny bit of shadow and detail. Step four, I painted or shaded medium gray on his face and part of his body. Step five, I added basic shadow under his eye’s sockets, under his nose, side of his face then some on his hair. Step six, now I add more detail and finished up. If you want to learn more, check out our +2 hours premium tutorials.